Emma has been running for her life! While alot of us were basking in the sunshine our dear Emma in our Office Supplies telesales department roped her mum and neice into doing the Cancer Research Race for Life on Sunday 7th July. 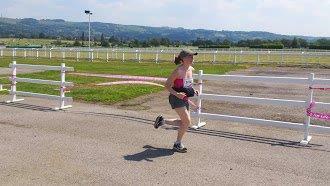 It was held at Cheltenham Racecourse and it was a very long 10K (about 7 miles) said Emma. The sun was scorching and there wasnt any shade and it was up hill and down dale! She said she felt like “Bobs Worth” (the winner of the Gold Cup 2013 just in case you dont following the racing). Most of the run was on the racecourse but it also went off course into the beautiful surrounding countryside. Coming up to the finish line Emma was ready to drop and had gone from a steady jog into a fast walk, but egged on by her neice she got into a trot again and completed the course in true Emma style – with lots of determination and alot of sweat apparently! With Cheltenham only being less than an hour away from the Forest of Dean the ladies were able to get home and put their weary feet up and relax – phew. Emma’s crew managed to raise an impressive £250 – good girls! She has promised to enthuse of us by next year at OfficeStar to enter…….so watch this space! You can leave comments by clicking here, leave a trackback at http://news.officestar-group.co.uk/index.php/emma-has-been-getting-hot-and-sweaty/trackback/ or subscibe to the RSS Comments Feed for this post.